"Old growth" redirects here. For the Dead Meadow album, see Old Growth (album). An old-growth forest — also termed primary forest or late seral forest — is a forest that has attained great age without significant disturbance and thereby exhibits unique ecological features and might be classified as a climax community. Old-growth features include diverse tree-related structures that provide diverse wildlife habitat that increases the biodiversity of the forested ecosystem. The concept of diverse tree structure includes multi-layered canopies and canopy gaps, greatly varying tree heights and diameters, and diverse tree species and classes and sizes of woody debris. Old-growth forests are valuable for economic reasons and for the ecosystem services they provide. This can be a point of contention when some in the logging industry may desire to cut down the forests to obtain valuable timber, while environmentalists seek to preserve the forests for benefits such as maintenance of biodiversity, water regulation, and nutrient cycling. Old-growth forests tend to have large trees and standing dead trees, multilayered canopies with gaps that result from the deaths of individual trees, and coarse woody debris on the forest floor. Forest regenerated after a severe disturbance, such as wildfire, insect infestation, or harvesting, is often called second-growth or 'regeneration' until enough time passes for the effects of the disturbance to be no longer evident. Depending on the forest, this may take from a century to several millennia. Hardwood forests of the eastern United States can develop old-growth characteristics in 150–500 years. In British Columbia, Canada, old growth is defined as 120 to 140 years of age in the interior of the province where fire is a frequent and natural occurrence. In British Columbia’s coastal rainforests, old growth is defined as trees more than 250 years, with some trees reaching more than 1,000 years of age. In Australia, eucalypt trees rarely exceed 350 years of age due to frequent fire disturbance. Forest types have very different development patterns, natural disturbances and appearances. A Douglas-fir stand may grow for centuries without disturbance while an old-growth ponderosa pine forest requires frequent surface fires to reduce the shade-tolerant species and regenerate the canopy species. In the Boreal-West Forest Region, catastrophic disturbances like wildfires minimize opportunities for major accumulations of dead and downed woody material and other structural legacies associated with old growth conditions. Typical characteristics of old-growth forest include presence of older trees, minimal signs of human disturbance, mixed-age stands, presence of canopy openings due to tree falls, pit-and-mound topography, down wood in various stages of decay, standing snags (dead trees), multilayered canopies, intact soils, a healthy fungal ecosystem, and presence of indicator species. 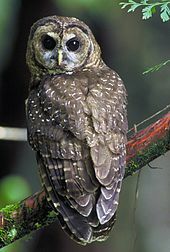 The northern spotted owl primarily inhabits old-growth forests in the northern part of its range (Canada to southern Oregon) and landscapes with a mix of old and younger forest types in the southern part of its range (Klamath region and California). 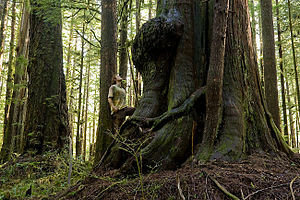 Old-growth forests are often biologically diverse, and home to many rare species, threatened species, and endangered species of plants and animals, such as the northern spotted owl, marbled murrelet and fisher, making them ecologically significant. Levels of biodiversity may be higher or lower in old-growth forests compared to that in second-growth forests, depending on specific circumstances, environmental variables, and geographic variables. Logging in old-growth forests is a contentious issue in many parts of the world. Excessive logging reduces biodiversity, affecting not only the old-growth forest itself, but also indigenous species that rely upon old-growth forest habitat. A forest in old-growth stage has a mix of tree ages, due to a distinct regeneration pattern for this stage. New trees regenerate at different times from each other, because each one of them has different spatial location relative to the main canopy, hence each one receives a different amount of light. The mixed age of the forest is an important criterion in ensuring that the forest is a relatively stable ecosystem in the long term. A climax stand that is uniformly aged becomes senescent and degrades within a relatively short time to result in a new cycle of forest succession. Thus, uniformly aged stands are less stable ecosystems. Forest canopy gaps are essential in creating and maintaining mixed-age stands. Also, some herbaceous plants only become established in canopy openings, but persist beneath an understory. Openings are a result of tree death due to small impact disturbances such as wind, low-intensity fires, and tree diseases. 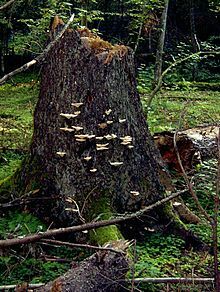 Old-growth forests are unique, usually having multiple horizontal layers of vegetation representing a variety of tree species, age classes, and sizes, as well as "pit and mound" soil shape with well-established fungal nets. Because old-growth forest is structurally diverse, it provides higher-diversity habitat than forests in other stages. Thus, sometimes higher biological diversity can be sustained in old-growth forest, or at least a biodiversity that is different from other forest stages. The characteristic topography of much old-growth forest consists of pits and mounds. Mounds are caused by decaying fallen trees, and pits (tree throws) by the roots pulled out of the ground when trees fall due to natural causes, including being pushed over by animals. Pits expose humus-poor, mineral-rich soil and often collect moisture and fallen leaves, forming a thick organic layer that is able to nurture certain types of organisms. Mounds provide a place free of leaf inundation and saturation, where other types of organisms thrive. Standing snags provide food sources and habitat for many types of organisms. In particular, many species of dead-wood predators such as woodpeckers must have standing snags available for feeding. In North America, the spotted owl is well known for needing standing snags for nesting habitat. Downed wood replenishes topsoil as it decays. Fallen timber, or coarse woody debris, contributes carbon-rich organic matter directly to the soil, providing a substrate for mosses, fungi, and seedlings, and creating microhabitats by creating relief on the forest floor. In some ecosystems such as the temperate rain forest of the North American Pacific coast, fallen timber may become nurse logs, providing a substrate for seedling trees. Intact soils harbor many life forms that rely on them. Intact soils generally have very well-defined horizons, or soil profiles. Different organisms may need certain well-defined soil horizons to live, while many trees need well-structured soils free of disturbance to thrive. Some herbaceous plants in northern hardwood forests must have thick duff layers (which are part of the soil profile). Fungal ecosystems are essential for efficient in-situ recycling of nutrients back into the entire ecosystem. Stand age can also be used to categorize forest as old-growth. For any given geographical area, the average time since disturbance until a forest reaches old-growth stage can be determined. This method is useful, because it allows quick and objective determination of forest stage. However, this definition does not provide explanation about forest function. It just gives a useful number to measure. So, some forests may be excluded from being categorized as old-growth even if they have old-growth attributes just because they are too young. Also, older forests can lack some old-growth attributes and be categorized as old-growth just because they are so old. The idea of using age is also problematic, because human activities can influence the forest in varied ways. For example, after logging of 30% of the trees, less time is needed for old-growth to come back than after removal of 80% of the trees. Although depending on the species logged, the forest that comes back after a 30% harvest may consist of proportionately less hardwood trees than a forest logged at 80% in which the light competition by less important tree species does not inhibit the regrowth of vital hardwoods. Stand-replacing: Disturbance hits the forest and kills most of the living trees. Stand-initiation: A population of new trees becomes established. Stem-exclusion: Trees grow higher and enlarge their canopy, thus competing for the light with neighbors; light competition mortality kills slow-growing trees and reduces forest density, which allows surviving trees to increase in size. Eventually, the canopies of neighboring trees touch each other and drastically lower the amount of light that reaches lower layers. Due to that, the understory dies and only very shade-tolerant species survive. Understory reinitiation: Trees die from low-level mortality, such as windthrow and diseases. Individual canopy gaps start to appear and more light can reach the forest floor. 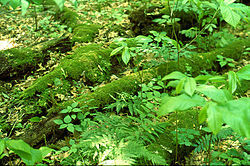 Hence, shade-tolerant species can establish in the understory. Old-growth: Main canopy trees become older and more of them die, creating even more gaps. Since the gaps appear at different times, the understory trees are at different growth stages. Furthermore, the amount of light that reaches each understory tree depends on its position relative to the gap. Thus, each understory tree grows at a different rate. The differences in establishment timing and in growth rate create a population of understory trees that is variable in size. Eventually, some understory trees grow to become as tall as the main canopy trees, thereby filling the gap. This perpetuation process is typical for the old-growth stage. This, however, does not mean that the forest will be old-growth forever. Generally, three futures for old-growth stage forest are possible: 1) The forest will be hit by a disturbance and most of the trees will die, 2) Unfavorable conditions for new trees to regenerate will occur. In this case, the old trees will die and smaller plants will create woodland, and 3) The regenerating understory trees are different species from the main canopy trees. In this case, the forest will switch back to stem-exclusion stage, but with shade tolerant tree species. 4) The forest in old-growth stage can be stable for centuries, but the length of this stage depends on the forest's tree composition and climate of the area. For example, frequent natural fires do not allow boreal forests to be as old as coastal forests of western North America. Of importance is that while the stand switches from one tree community to another, the stand will not necessarily go through old-growth stage between those stages. Some tree species have relatively open canopy. That allows more shade-tolerant tree species to establish below even before understory reinitiation stage. The shade-tolerant trees eventually outcompete the main canopy trees in stem-exclusion stage. Therefore, the dominant tree species will change, but the forest will still be in stem-exclusion stage until the shade tolerant species reach old growth stage. Tree species succession may change tree species' composition once the old-growth stage has been achieved. For example, an old boreal forest may contain some large aspen trees, which may die and be replaced by smaller balsam fir or black spruce. Consequently, the forest will switch back to understory reinitiation stage. Using the stand dynamincs definition, old-growth can be easily evaluated using structural attributes. However, in some forest ecosystems, this can lead to decisions regarding the preservation of unique stands or attributes that will disappear over the next few decades because of natural succession processes. Consequently, using stand dynamics to define old-growth forest is more accurate in forests where the species that constitute old-growth have long lifespans and succession is slow. Redwood tree in northern California redwood forest: According to the National Park Service, "96 percent of the original old-growth coast redwoods have been logged." The forest itself is a remnant natural area that has not been subjected to significant disturbance by mankind, altering the appearance of the landscape and its ecosystems, has not been subjected to logging, and has inherently progressed per natural tendencies. The debate over old-growth definitions has been inextricably linked with a complex range of social perceptions about wilderness preservation, aesthetics, and spirituality, as well as economic or industrial values. In logging terms, old-growth stands are past the economic optimum for harvesting – usually between 80-150 years, depending on the species. Old growth forests were often given harvesting priority because they had the most commercially valuable timber, they were considered to be at greater risk of deterioration through root rot or insect infestation, and they occupied land that could be used for more productive second-growth stands. In some regions, old growth is not the most commercially viable timber – in British Columbia, Canada, harvesting in the coastal region is moving to younger second-growth stands. Avatar Grove near Port Renfrew, British Columbia: Giant Douglas firs (left) and red cedars (right) fill the grove. Old-growth forests often contain rich communities of plants and animals within the habitat due to the long period of forest stability. These varied and sometimes rare species may depend on the unique environmental conditions created by these forests. Old-growth forest serves as a reservoir for species which cannot thrive or easily regenerate in younger forest, so can be used as a baseline for research. Plant species that are native to old-growth forests may someday prove to be invaluable towards curing various human ailments, as has been realized in numerous plants in tropical rainforests. Old-growth forests also store large amounts of carbon above and below the ground (either as humus, or in wet soils as peat). They collectively represent a very significant store of carbon. Destruction of these forests releases this carbon as greenhouse gases, and may increase the risk of global climate change. Although old-growth forests therefore serve as a global carbon dioxide sink, they are not protected by international treaties, because it is generally thought that ageing forests cease to accumulate carbon. However in forests between 15 and 800 years of age, net ecosystem productivity (the net carbon balance of the forest including soils) is usually positive - old-growth forests accumulate carbon for centuries and contain large quantities of it. Old-growth forests provide ecosystem services that may be far more important to society than their use as a source of raw materials. These services include making breathable air, making pure water, carbon storage, regeneration of nutrients, maintenance of soils, pest control by insectivorous bats and insects, micro- and macro-climate control, and the storage of a wide variety of genes. The effects of old-growth forests in relation to global warming has been contested in various studies and journals. Old-growth forests are often perceived to be in equilibrium or in a state of decay. However, evidence from analysis of carbon stored above ground and in the soil has shown old-growth forests are more productive at storing carbon than younger forests. Forest harvesting has little or no effect on the amount of carbon stored in the soil, but other research suggests older forests that have trees of many ages, multiple layers, and little disturbance have the highest capacities for carbon storage. As trees grow, they remove carbon from the atmosphere, and protecting these pools of carbon prevents emissions into the atmosphere. Proponents of harvesting the forest argue the carbon stored in wood is available for use as biomass energy (displacing fossil fuel use), although using biomass as a fuel produces air pollution in the form of carbon monoxide, nitrogen oxides, volatile organic compounds, particulates, and other pollutants, in some cases at levels above those from traditional fuel sources such as coal or natural gas. Each forest has a different potential to store carbon. For example, this potential is particularly high in the Pacific Northwest where forests are relatively productive, trees live a long time, decomposition is relatively slow, and fires are infrequent. The differences between forests must, therefore, be taken into consideration when determining how they should be managed to store carbon. Old-growth forests have the potential to impact climate change, but climate change is also impacting old-growth forests. As the effects of global warming grow more substantial, the ability of old-growth forests to sequester carbon is affected. Climate change showed an impact on the mortality of some dominant trees species, as observed in the Korean pine. Climate change also showed an effect on the composition of species when forests were surveyed over a 10- and 20-year period, which may disrupt the overall productivity of the forest. According to the World Resources Institute, as of January 2009, only 21% of the original old-growth forests that once existed on earth are remaining. An estimated one-half of Western Europe's forests were cleared before the Middle Ages, and 90% of the old-growth forests that existed in the contiguous United States in the 1600s have been cleared. The large trees in old-growth forests are economically valuable, and have been subjected to aggressive logging around the world. This has led to much controversy between logging companies and environmental groups. From certain forestry perspectives, fully maintaining an old-growth forest is seen as extremely economically unproductive, as timber can only be collected from falling trees, and also potentially damaging to nearby managed groves by creating environments conducive to root rot. From this view, it may be more productive to cut the old growth down and replace the forest with a younger one. Conversely, old-growth forests have significant environmental value, creating a stable ecological environment and promoting biological diversity. The island of Tasmania, just off the southeast coast of Australia, has the largest amount of temperate old-growth rainforest reserves in Australia with around 1,239,000 hectares in total. While the local Regional Forest Agreement (RFA) was originally designed to protect much of this natural wealth, many of the RFA old-growth forests protected in Tasmania consist of trees of little use to the timber industry. RFA old-growth and high conservation value forests that contain species highly desirable to the forestry industry have been poorly reserved. Only 22% of Tasmania’s original tall-eucalypt forests managed by Forestry Tasmania have been reserved. Ten thousand hectares of tall-eucalypt RFA old-growth forest have been lost since 1996, predominantly as a result of industrial logging operations. In 2006, about 61,000 hectares of tall-eucalypt RFA old-growth forests remained unprotected. Recent logging attempts in the Upper Florentine Valley have sparked a series of protests and media attention over the arrests that have taken place in this area. Additionally, Gunns Limited, the primary forestry contractor in Tasmania, has been under recent criticism by political and environmental groups over its practice of woodchipping timber harvested from old-growth forests. Old-growth forest in the Opal Creek Wilderness, a wilderness area located in the Willamette National Forest in the U.S. state of Oregon, on the border of the Mount Hood National Forest. It has the largest uncut watershed in Oregon. The increased understanding of forest dynamics in the late 20th century has led the scientific community to identify a need to inventory, understand, manage, and conserve representative examples of old-growth forests with their associated characteristics and values. The literature around old growth and its management is inconclusive about the best way to capture the true essence of an old-growth stand. A better understanding of natural systems has resulted in new ideas about forest management, such as managed natural disturbances should be designed to achieve the landscape patterns and habitat conditions that are normally maintained in nature. This coarse filter approach to biodiversity conservation recognizes ecological processes and provides for a dynamic distribution of old growth across the landscape. And all seral stages – young, medium and old – support forest biodiversity. Plants and animals rely on different forest ecosystem stages to meet their habitat needs. In Australia, the Regional Forest Agreement (RFA) attempted to prevent the clearfelling of defined "old-growth forests". This led to struggles over what constitutes "old growth". For example, in Western Australia, the timber industry tried to limit the area of old growth in the karri forests of the Southern Forests Region; this led to the creation of the Western Australian Forests Alliance, the splitting of the Liberal Government of Western Australia and the election of the Gallop Labor Government. Old-growth forests in this region have now been placed inside national parks. A small proportion of old-growth forest also exists in South-West Australia, and is protected by federal laws from logging, which has not occurred there for more than 20 years. In British Columbia, Canada, old-growth forests must be maintained in each of the province’s ecological units to meet biodiversity needs. 35% in Latin America: The Amazon rainforest is mainly located in Brazil, which clears a larger area of forest annually than any other country in the world. 28% in North America, which harvests 10,000 km2 of ancient forests every year. Many of the fragmented forests of southern Canada and the United States lack adequate animal travel corridors and functioning ecosystems for large mammals. Most of the remaining old-growth forests in the contiguous United States and Alaska are on public land. 8% in Africa, which has lost most of its intact forest landscapes in the last 30 years. The timber industry and local governments are responsible for destroying huge areas of intact forest landscapes and continue to be the single largest threat to these areas. 7% in South Asia Pacific, where the Paradise Forests are being destroyed faster than any other forest on Earth. Much of the large, intact forest landscapes have already been cut down, 72% in Indonesia, and 60% in Papua New Guinea. Less than 3% in Europe, where more than 150 km2 of intact forest landscapes are cleared every year and the last areas of the region’s intact forest landscapes in European Russia are shrinking rapidly. In the United Kingdom, they are known as ancient woodlands. ^ White, David; Lloyd, Thomas (1994). "Defining Old Growth: Implications For Management". Eighth Biennial Southern Silvicultural Research Conference. Retrieved 23 November 2009. ^ Williams, Jann; Woinarski, John (1997-11-13). Eucalypt Ecology. ISBN 9780521497404. ^ a b "Ministry of Natural Resources and Forestry" (PDF). Ontario.ca. ^ Stamets, Paul (2005). Mycelium Running. Ten Speed Press. p. 35. ISBN 978-1-58008-579-3. ^ Forest Stand Dynamics. 1996. Oliver C.;Larson B. ^ Frequently Asked Questions nps.gov'.' Retrieved February 11, 2009. 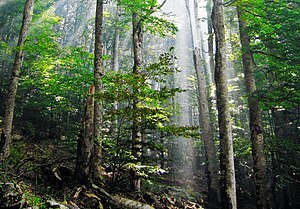 ^ "What is old-growth forest?". ^ "Old-growth Forests in Canada - A Science Perspective". fao.org. ^ "Page moved - 10drugs.htm". mongabay.com. ^ "Climate Change 2001: The Scientific Basis". grida.no. ^ Luyssaert, S; Schulze, ED (2008). "Old-growth forests as global carbon sinks". Nature. 455 (7210): 213–5. doi:10.1038/nature07276. PMID 18784722. ^ McGarvey, Jennifer; Thompson, Jonathan R.; Epstein, Howard E.; Shugart, Herman H. (2015-02-01). "Carbon storage in old-growth forests of the Mid-Atlantic: toward better understanding the eastern forest carbon sink". Ecology. 96 (2): 311–317. doi:10.1890/14-1154.1. ISSN 1939-9170. ^ Keith, Heather; Mackey, Brendan G.; Lindenmayer, David B. (2009-07-14). "Re-evaluation of forest biomass carbon stocks and lessons from the world's most carbon-dense forests". Proceedings of the National Academy of Sciences. 106 (28): 11635–11640. doi:10.1073/pnas.0901970106. ISSN 0027-8424. PMC 2701447. PMID 19553199. ^ "A synthesis of the science on forests and carbon for U.S. Forests - Forest Service Research & Development". fs.fed.us. ^ Eartha Jane Melzer (January 26, 2010). "Proposed biomass plant: Better than coal?". The Michigan Messenger. Archived from the original on February 5, 2010. ^ Zhang, J.; Smith, K. R. (2007). "Household Air Pollution from Coal and Biomass Fuels in China: Measurements, Health Impacts, and Interventions". Environmental Health Perspectives. 115 (6): 848–855. doi:10.1289/ehp.9479. PMC 1892127. PMID 17589590. ^ "Announcement". Archives of Virology. 130 (1–2): 225. 1993. doi:10.1007/BF01319012. ^ "CARBON MANAGEMENT IN NATURAL ECOSYSTEMS". grida.no. ^ Dai, Limin; Jia, Juan; Yu, Dapao; Lewis, Bernard J.; Zhou, Li; Zhou, Wangming; Zhao, Wei; Jiang, Linhai (2013-07-15). "Effects of climate change on biomass carbon sequestration in old-growth forest ecosystems on Changbai Mountain in Northeast China". Forest Ecology and Management. Shaping Forest Management to Climate Change. 300: 106–116. doi:10.1016/j.foreco.2012.06.046. ^ van der Sande, Masha T.; Arets, Eric J. M. M.; Peña-Claros, Marielos; de Avila, Angela Luciana; Roopsind, Anand; Mazzei, Lucas; Ascarrunz, Nataly; Finegan, Bryan; Alarcón, Alfredo (2016-05-01). "Old-growth Neotropical forests are shifting in species and trait composition". Ecological Monographs. 86 (2): 228–243. doi:10.1890/15-1815.1. ISSN 1557-7015. ^ "Opal Creek Wilderness". The Cranberry House. Retrieved 2007-08-20. ^ (DeLong 1998; Wong and Iverson 2004). ^ "Intact Forest Landscapes". intactforests.org. ^ a b c d "Intact Forest Landscapes". Greenpeace International. ^ "BOREALFOREST.ORG - Boreal Forests of the World - Introduction". borealforest.org. 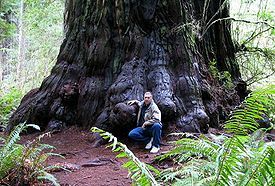 Wikimedia Commons has media related to Primeval forests.